I love my crock pot and use it quite often. I have found that this summer it hasn't been used as much. 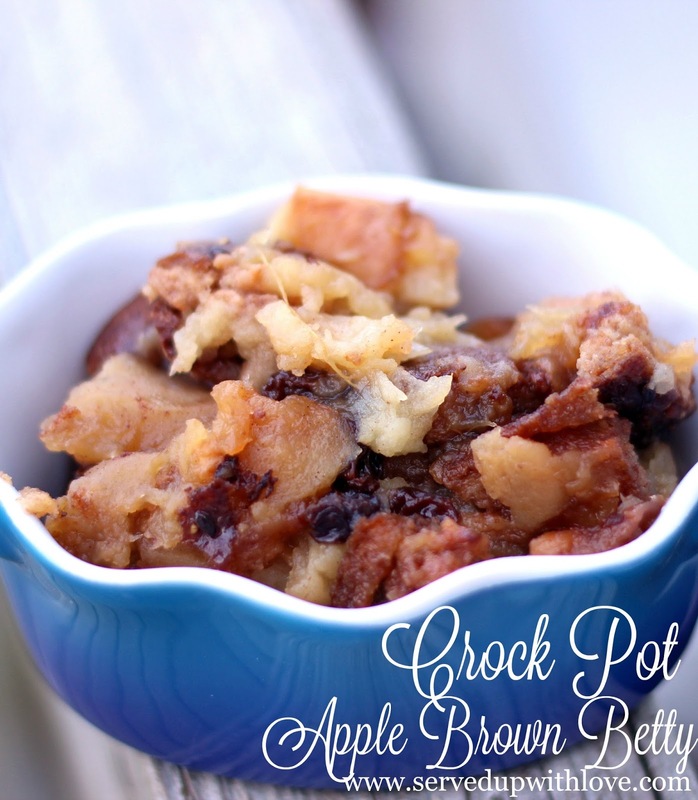 I have to admit I have never made a dessert in my crock pot and was intrigued when I saw this recipe. I knew this had to be the first thing I tried. I had some whole grain bread that seemed to just sit on the counter. I try to buy the healthy stuff and then no one eats it but me. So I had to do something with all this bread. I combined a little bit of white bread along with it because it was starting to get a little stale. When my husband came home from work the house was smelling super yummy and the first thing he said was, "what are you making?" This was the perfect dessert on a hot summer day. After dinner I took some to my parents and surprised them. They like when I show up with goodies. We all really enjoyed this and no one was the wiser that it was whole grain bread. If that is what it takes to get them to eat it, then so be it. My crock pot cooked this in 2 hours. Crock pots vary, mine seems to run a little hotter. Wash apples, peel, core, cut into eighths; place in bottom on crock. Combine bread cubes, cinnamon, nutmeg, salt, sugar, butter and raisins; toss together. 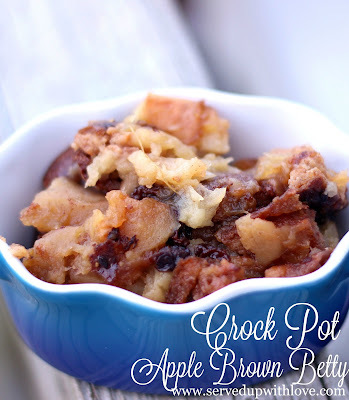 Place on top of apples in crock. Cover. Cook on low setting 2 to 4 hours. Makes 6 to 8 servings. Crockpots vary, mine was done at 2 hours. M-M-M-M! I love making desserts in my crockpot. 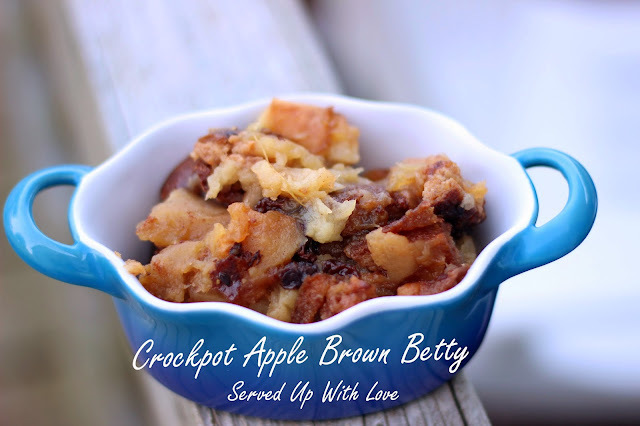 Have made an apple crisp but not a brown betty. Lovely! Thanks so much for sharing with us at Weekend Potluck. Please come back again soon. Where does the melted butter come in? THANKS! You add the butter in with the spices, bread cubes, and raisins. Hope that helps.